Recently, I examined a couple parts of Lord Christopher Monckton’s latest testimony before a committee of the U.S. House of Representatives (see The Monckton Files: Solar Variation and The Monckton Files: “We Are the World”). After I posted the first of these, Richard Littlemore blogged about it on DeSmogBlog with a post entitled, “Christopher Monckton Humiliated Yet Again: If the Viscount of Brenchley Says It; Does That Mean It Has To Be Wrong?” In the course of blogging about Monckton’s various misrepresentations, I hope I haven’t given the impression that everything the guy says is wrong. So, here I will point out an instance in which I think Monckton got it right… and then managed to make this perfectly legitimate issue explode into a giant, flaming ball of hypocrisy. Lord Monckton has repeatedly criticized the IPCC because it included the following figure in FAQ 3.1 of the 2007 Working Group 1 report. Figure 1. Graph of global mean temperature that forms part of a figure in FAQ 3.1 of the 2007 IPCC Working Group 1 report. Linear trend fits to the last 25 (yellow), 50 (orange), 100 (purple) and 150 years (red) are shown, and correspond to 1981 to 2005, 1956 to 2005, 1906 to 2005, and 1856 to 2005, respectively. 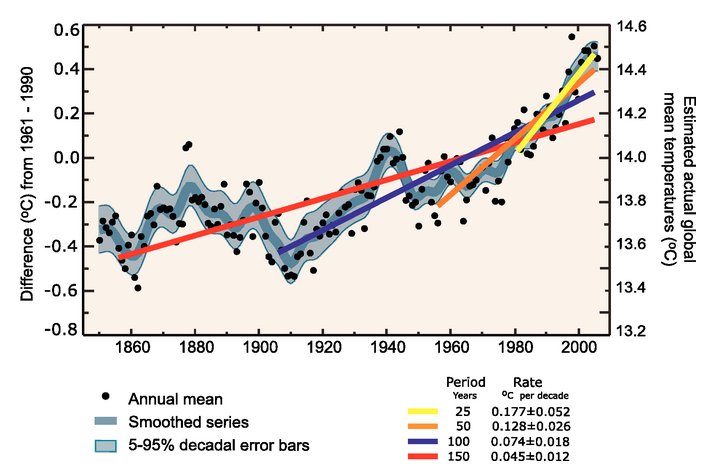 Note that for shorter recent periods, the slope is greater, indicating accelerated warming. 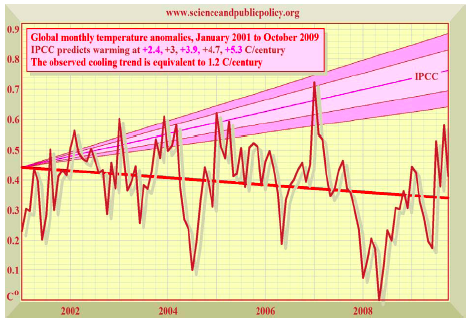 Monckton attended a lecture by IPCC Chairman Rajendra Pachauri, who used this graph to make the same point. He subsequently wrote an open letter to Pachauri urging him to stop using the graph. One of Monckton’s main reasons for criticizing the graph is summarized in the following figure, taken from the letter. Figure 2. Here Lord Monckton shows that there have been a couple other 20- to 30-year periods since 1850 that have had warming trends similar to the present one. The last three decades are not notable because global warming has accelerated so much during that period. Rather, they are notable because all of the natural factors that force the climate (like solar output and volcanic activity) have either been flat or promoting some cooling, and yet, the Earth has still been strongly warming. Therefore, it is likely that even if the natural cycles go back and forth, we are in for a long, sustained warming period if we don’t curtail our greenhouse gas emissions. After making this completely reasonable criticism, however, Lord Monckton went on to draw some rather wild conclusions from the graph shown in Fig. 2. The above diagram represents the unvarnished truth. The correct conclusion, therefore, is that there is no discernible human influence on global temperature: merely a continuation of the recovery of global temperatures from the Little Ice Age (a recovery that began 300 years ago), overlaid by an apparent ~60-year cycle in global temperatures. But what can any temperature vs. time graph tell us about the causes of warming or cooling? 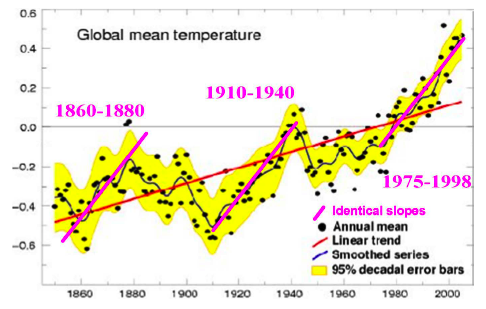 For that, you have to compare temperature trends to output from models that incorporate all the major known causes. Monckton realized this, and so he produced the graph shown in Fig. 3. Figure 3. Monckton provided this temperature vs. time graph to Pachauri to show that the temperature trend over that period fell far short of the IPCC's predictions. One problem--the IPCC "prediction" depicted is fake. Though we do not assert that a nine-year temperature trend indicates anything more than natural variability in the climate, and though it should be noted that in the above diagram the IPCC’s projections are for equilibrium temperature change on the A2 scenario, the contrast between the picture of events portrayed in this graph and the picture falsely portrayed in the artificially-chosen trend lines in the IPCC’s defective graph is stark. Now, that would be fine, except that in a recent post on RealClimate, I showed that Monckton had gotten his equilibrium model predictions using false atmospheric CO2 data for the A2 scenario. (I followed up on his reply to my original post here.) And why use equilibrium model predictions to compare with a time-series of data, when the IPCC has published a convenient graph of time-series model output for the A2 scenario? (ANSWER: Because that would show the temperature oscillating within the range of predicted values.) Finally, I also showed that several other scientists had given nearly identical criticisms of Monckton’s graphs several times before I did. ON THE ONE HAND, it seems to me that whoever was responsible for the IPCC graph in Fig. 1 may have just made an honest mistake. The idea that it isn’t always kosher to directly compare trends over different lengths of time (even though all the trends are statistically significant,) seems like a rather subtle point about the use of statistics. Often, scientists have only taken a single statistics course during college, so it’s completely plausible that many would not have gotten the memo. ON THE OTHER HAND, plotting false data on a graph, and continuing to do so even after several scientists have pointed out the (obvious) error, seems to me to be on an entirely different level, even if the person(s) responsible for the IPCC graph knew their comparison was misleading. Am I wrong? And Throw Away the Key!!! In Monckton’s case, we’re talking about a clear-cut case of data fabrication which, by any standard, is worse than what Monckton accused Pachauri of. In fact, Monckton also accused Pachauri of using his IPCC position for financial gain, but an independent audit of Pachauri’s finances found no wrongdoing. [UPDATE: Climate Progress reports that now even the perennially contrarian UK newspaper, The Telegraph, has apologized for suggesting that Pachauri was making money from these supposed conflicts of interest.] Furthermore, Monckton has been known to garner extremely large speaking fees for his anti-climate change show. Given that Monckton’s offense is arguably the more egregious, let’s see what His Mendacity had in mind as punishment for Pachauri. We should be grateful for your response within 48 hours, failing which we shall be entitled to presume that you, the IPCC and the EPA – to whose administrator we are copying this letter – intend to conspire, and are conspiring, to obtain a pecuniary advantage by deceiving the public as to the nature, degree, and significance of the global surface temperature trend. In that event, conspiracy to defraud taxpayers would be evident, and we should be compelled to place this letter in the hands of the relevant investigating and prosecuting authorities. So I confronted him with this, and I said, “This is fraudulent. You’re not to use it. I explained why it was wrong. I gave him 48 hours to correct it, and I gave him a letter, 10 pages long, explaining in great detail, including an answer I’d got from the British government obtained from the IPCC about this graph, that it was wrong. I gave him 48 hours to reply. He didn’t reply. I am now going to turn that letter over to the Indian police, and I am going to say that Rajendra Pachauri is a fraudster on one of the biggest scales I’ve ever seen in the world…. I gave him 48 hours to come back to me. He didn’t do it. He is going to jail for fraud. You heard it here first. We can thank Lord Monckton for clearing up what should be done about fraudulent graphs! Ooh, you’re in BIG trouble now – the merry Monckton is going to doubly sue you for trying to sue him for trying to sue, um, whatever. Expect the summons…when hell freezes over. He’s just biding his time…. And even if Pachauri has creamed off, and even if Al Gore is a carbon billionaire, and even if Mick Jagger screws around, and even if Lord Monckton wins debates, it does not change the laws of physics or the science. This is all irrelevant window dressing to distract from the actual matter. Who is actually providing Monckton with all the sue-age money?